As a software engineer in the Highly Automated Driving division, I spend most days working on an Android app that helps our HERE True Car drivers monitor the health of our data collection hardware. Helping drivers navigate on specific routes to collect fresh data is a big part of what that application does. Recently, a new product called HERE XYZ went into Beta as a simple solution to store geospatial data. I sat down with Jayson DeLancey to review and discuss a project I built to try out the new tools. As a regular runner too annoyed to carry a flask with me on the move, I occasionally get thirsty and have to use my fuzzy brain to remember the closest drinking water fountain. 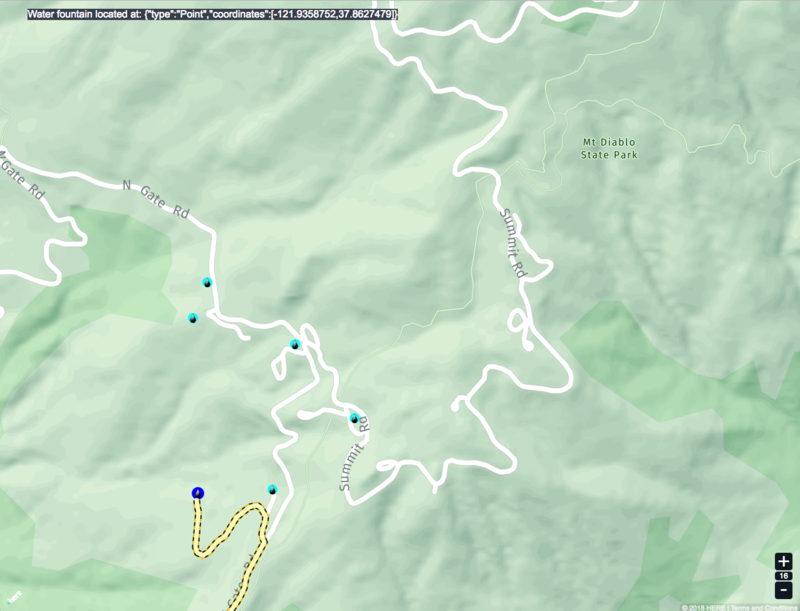 I figured it would be nice to have a simple web application to show nearby drinking water to reduce time wandering about. I think it could be useful for dog owners and hikers as well. How did you find water fountain data in the first place? There are many data sources such as the Seattle Parks & Recreation and California Open Data Portal that can be useful for projects. In this case, I used a tool called overpass turbo (MIT License) to filter Open Street Map data where “amenity=drinking_water” for North America and exported it as GeoJSON. curl -X GET "https://xyz.api.here.com/hub/spaces" -H "accept: */*" -H "Authorization: Bearer AXoqaCXh6cAqoz0nDxEzUCo"
Should we think of HERE XYZ as just GeoJSON file storage? For example, the following code shows an object being returned which fetches data from an XYZ space such as the water fountain dataset. You just need to identify the space provider with space id and access token. The data can then be styled with any custom icons or other CSS properties. How did you integrate in routing? I took care of preparing and uploading the dataset. After making sure all the above was working, I added positioning. The use of HTML5 Geolocation APIs are pretty well documented so that should be easy for anyone to get started. Something developers don’t do enough though, including myself, is the handling of error cases, e.g. if the user denies sharing the location or if the location fetching fails for any reason. Finally, I added the routing part from the current position to a clicked drinking water fountain. The documentation gives a description of how to Interact with your data by using addEventListener. That is just combined with examples online with the HERE Routing API. I recommend doing the very first request for routing with the least number of parameters, e.g. mode, start, destination and get a successful result before then looking at more granular parameters to tweak the request. Personally, I focused on pedestrian and going for the shortest distance. I will go back to working on my day job. I am obviously pretty excited by the autonomous driving field and the work we do at HERE Technologies as I believe it will tremendously improve people’s lives. I’m confident the more autonomous cars on the roads, ultimately the safer and less trafficked those roads will be. Definitely a fun project hacking something together with XYZ. I had in mind to display turn-by-turn maneuvers, hence using the parameter maneuverattributes but didn’t get a chance to implement this yet. Some other future directions on a project like this include integrating into a fitness app like Garmin, Nike+, Strava, Fitbit, etc. It might also be a good idea to create a mechanism to update water fountain data and push it back to OpenStreetMap to create a virtuous cycle. You can find the complete source code for this here-xyz-thirst-free project on GitHub. Boris is a Senior Software Engineer with HERE Technologies in Berkeley, CA. He studied software engineering across three different universities (and countries). He focuses on Java and Kotlin building mobile applications used within Highly Automated Driving. An avid runner, he has also been following trends for clean/plant-based meat.